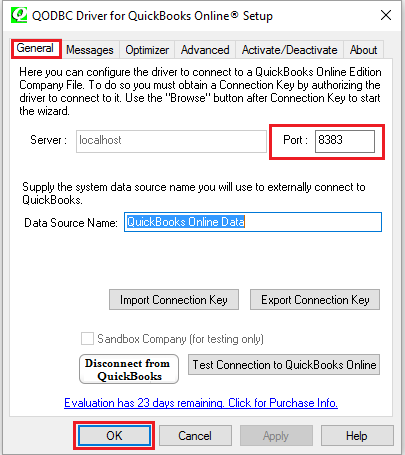 I am trying to connect to QuickBooks Online using QODBC Online. But I am getting below error at the time of connection. 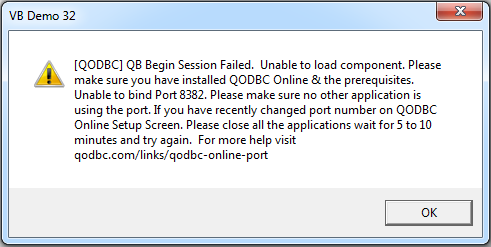 QODBC Online is using default port 8383. 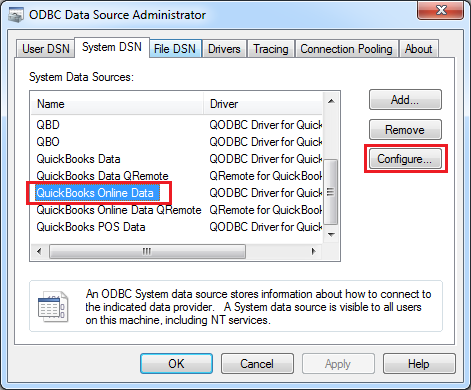 You will get above error message when you have changed the port number in QODBC Online. So, If you have changed the port number from QODBC Online Setup Screen, then Please close all the applications wait for 5 to 10 minutes and try to connect again. If above does not resolve the issue, then please make sure that there is no other application is using this port. If any other application is not using the port which you have specified on QODBC Online Setup Screen, then you need to restart windows & test again. If any other application is using the port which you have specified on QODBC Online Setup Screen, then you need to change the port from QODBC Online Setup Screen. Just write the port number which you want to use in "Port:" textbox & click "OK". In this example, I am changing it to default port 8383. After changing the port, Please close all the applications wait for 5 to 10 minutes and try to connect again. If it does not work, then you need to restart windows & test again.